Corsair, an American hardware company, have gone from strength to strength in the last 25 years, starting out making DRAM modules and slowly encompassing a large portion of the peripherals and PC hardware market, with SSDs, keyboards, headsets, fans, cases and a whole lot more. Today, we take things back to their roots and look at a brand new RAM kit, this time they aim to bolster their position as the go-to for high performance DDR4 memory with fierce competition from Corsair, G.SKILL, TeamGroup and Kingston with their HyperX brand. This arrives in the form of the Corsair Dominator Platinum RGB, the design isn’t new but the RGB lighting certainly is, and in-fact, this is the first product to feature Corsair’s new Capelix RGB LEDs, a new LED technology designed in partnership with Primax to minimise the space required by LEDs which can increase density and brightness. The Dominator Platinum RGB kits arrive in capacities ranging from 16GB right up to 128GB in a mixture of both 8GB and 16GB modules. The spectrum of speeds is also vast, starting at 3000MHz and moving all the way up to 4800MHz for those seeking the absolute most extreme RAM available. Guaranteeing these speeds, and tight timings, is a tight screening process from high-frequency memory chips along with a custom 10-layer PCB and aluminium heat spreaders to provide generous overclocking headroom. We’ve been provided with a kit that should be, on paper at least, blindingly fast, boasting some impressive CAS latency timings of 14-14-14-34 at 3200MHz in a quad-DIMM package of 32GB. 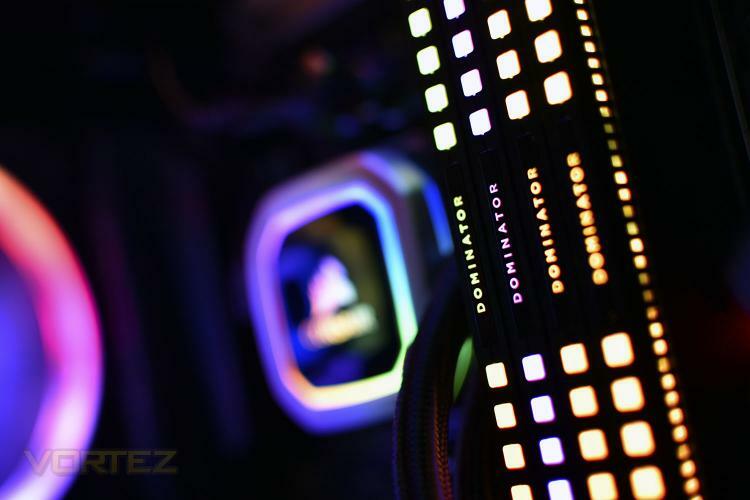 The Dominator Platinum RGB has been designed with Intel and AMD platforms in mind and is rated to work on both. The elephant in the room with this kit is undoubtedly the pricing, at £499 in the UK and $549 in the US, this is considerably more expensive than any other kit we’ve tested around this speed or capacity, with it being possible to find 64GB at a similar price, but can the performance really make a difference?